← Wikileaks Clinton-DNC collusion revelation: Did Russians hack DNC to help Trump? Posted on July 27, 2016, in Ask Lada, EARTH SHIFT, Empire Collapse, Predictions 2014 & Long-Term, USA/EU/West and tagged #bernieorbust, #DNCleak, #hillaryforprison, Author Lada Ray, Bernie Sanders, Chris Hedges, corruption, Democracy Now!, democratic convention, democrats, Donald Trump, Dr. Jill Stein, Earth Shift system, Garry Johnson, Green Party, Hillary Clinton, Lada Ray predictions, Libertarian party, Neoliberal Order, NWO, Quantum Calibrations, republican convention, republicans, revolution, Robert Reich, RT, third party candidate, US elections 2016, Wikileaks. Bookmark the permalink. 17 Comments. oh what is your take on the view that putin want’s to restore the russian monarchy the romonov blood-line to power? Listen to Lada, she has the inside scoop on the 2016 election… stay informed, do not blindly vote for the “LESSER of 2 EVILS”. PS: Incidentally, this hack WP reporter made me LMAO! MSM crankin’ the yellow press full steam! I am considering a WRITE-IN candidate by the name of: Andy Basiago. He can be found here if anyone is interested. andy2016 dot com I think he, more than anyone would move us ahead by 100 years most likely in his first year of office. Many Youtubes of him as well. Andy is a time traveler and there are obscure predictions he will be president. Perhaps on a different timeline. 1. Not really. 2. He won’t. This nothing new when I lived in the USA in the seventies and early eighties there was a movement Nobody For President. 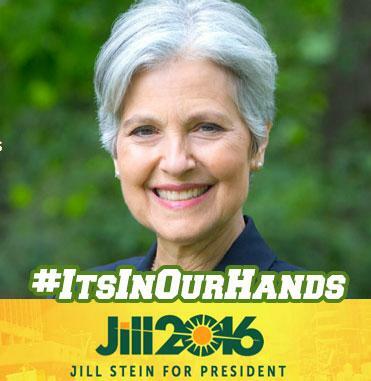 Jill Stein isn’t a nobody. Unfortunately. I would have supported Cynthia McKinney, but not that woman. I would have thought that you would care about the candidates and their policies on Russia. I interacted with the Greens back when Cynthia McKinney was their candidate. It was with disgust I saw Stein edge out Cynthia, it wasn’t pretty or even decent. Votes for 3rd parties, thanks to the stupid US system, are going to just be votes for the war monger world ending, war criminal, liar Hillary aka hitley KKKlinton. I suggest you use your anger productively and protest, make your voice heard out there. Here – you are barking at the wrong tree, dear. I’m not the enemy. Incidentally, didn’t notice once Jill Stein being anti-Russian. Saw her many times being quite balanced. Regardless, you should really read my articles more carefully. I said that vote for Stein is a vote against Hillary. I never said Stein could win THIS election. It’s a protest vote AGAINST HILLARY that helps ensure she doesn’t win, and this is how I recommend people use it. My problem with the Greens is that they have a history at least in Europe and especially in Germany of being very anti Russian and supportive of Nato and its interventionist actions in Serbia and Libya. I understand that Jill Stein may be different but it’s just something to keep in mind. Unless there is some very hidden diabolical plans from the ruling elite that hasn’t been exposed yet in clandestinely supportive of Trump and unless there is a 180 degree turn in his statements to date, I’m going with Trump. I believe that to have a Republican candidate for president speak out on issues that are totally against what the Republican Party has stood for in the past and totally against the neocons is absolutely breathtaking. Even with all the Russia baiting directed at Trump still Trump to this day cannot get himself to blurt out anything negative on Russia and Putin. This fact alone makes me support Trump. In addition he’s flat out against Nafta, TPP, TPIP, Nato, and the foreign interventions in Ukraine and the middle East. He places the blame on Obama and Hillary for the Islamic terrorism which was created by the interventions in Iraq (which he also was against), Syria and Libya. One of his slogans is Americanism not globalism. I mean c’mon there’s not much to dislike of him. OK so he doesn’t have polite manners regarding immigrants. He’s not perfect but on the really big issues like war and peace he’s so far great. He’s causing panic among the warmongers and neocons. I think he’s the real deal. To get votes he doesn’t have to say anything positive about Putin. He can just play it safe and bad mouth him. But he doesn’t. This is what is truly remarkable about Trump. COMPARED TO BERNIE SANDERS TRUMP HAS BALLS. One last provocative question I would like to have answered. Is it possible that Trump could be the Boris Yeltsin of the United States. Yeltsin smashed the USSR along with the Warsaw Pact and every country went on its own (of course Yeltsin caused the horrible ’90’s). Is it possible that Trump will smash the US imperium and Nato. Something to think about. I think we need a bull in the china shop now. This rotten system has to be broken up. It’s beyond repair and maybe Trump is called to do it. By the way here’s an excellent interview of Michael Hudson, economist extraordinaire, talking very positively about Trump. One other point I forgot to mention. As I said before Bernie Sanders is a disgraceful wimp while Trump has guts. If the Republican party was able to do to Trump that the Democratic party did to Sanders I guarantee 100% that Trump would have headed a third party like the Libertarian. That’s the difference between these two men. Sanders really missed the historic opportunity to take the high road by not accepting to lead the Greens but took the low road of sniveling up to a creep like Clinton who openly cheated Sanders the nomination. Sanders is like the wife that is beaten on a daily basis by her sadistic husband only in the end she begs for his forgiveness. In the end Sanders is just a hack opportunistic politician which I knew from the beginning. Hi Lada the positive remarks on Russia keep on coming from Trump. He said in an interview that the people of Crimea decided they wanted to be in Russia. Jill Stein’s a nice and good person and probably on the higher calibration scale than Trump but let’s face it she has no chance in the election. You don’t even hear Jill Stein talk about Russia as well meaning and positive as Trump. Unless Trump makes a U turn on Russia between now and November I’m throwing my support behind him. C’mon folks a Republican contender with such positive feelings about Russia and Putin. This is truly historic.